Hal Meeks is a Raleigh-based artist and designer, and will be teaching Saturday's Stop Motion Animation workshop. He recently graduated from the Masters of Art + Design program at NC State University College of Design, focusing on New Media. He also works at NCSU as a digital media consultant. 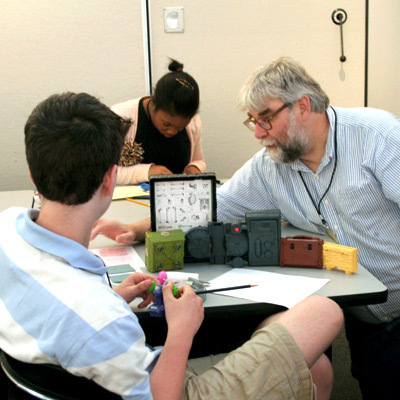 Hal has taught numerous sessions of Design Camp, where he has perfected the art of teaching students to make amazing stop motion films in just one day. Besides walking away with a finished (short) film, Hal's project teaches fundamentals of visual storytelling, beginning with the importance of making storyboards to get started. In the Stop Motion Animation workshop, middle school students will work with a variety of materials to put together a short stop motion animation. Along the way, they will learn to tell visual stories and make movies. We will bring objects and drawings to life! There are a few spots remaining in Saturday's workshop. The registration form is available here. If you'd like us to save you a space, just give us a call at 919-513-8153. I teach workshops and work as a digital media consultant for NC State University. I take an insane number of photographs and video. I make stuff. I took a film production class in college because it sounded like fun. I messed around with computers, musical instruments and other stuff. Why are you teaching this workshop? Because visual communication and narratives are such a big part of how we communicate today. We are wired for it. It is why our cell phones have cameras. What can participants expect to do, learn, or make in your workshop? Plan, build and make a short stop motion animation with sound using storyboarding found materials and a dash of digital tools. At the end the students will have some idea of what goes into making a short movie, plus they will have a finished thing. It can tell a story or do something else. It's their decision. I love polyureathane foam. Pieces of semi-functional or broken electronic gear. I like sharpies and paper too. Favorite color or color palette? Best thing you've ever made? The thing I am happiest with is a short documentary I shot of a friend of mine who made some plastic parts from a drawing to a finished object. It is too long and boring, but I still like looking at it because what he is doing is a form of magic. Paris, San Francisco and Booth Bay Harbor Maine. Wow. That's tough. Andy Warhol. Carvaggio. Kadinsky. Raschenberg. Brian Eno. John Cage. John Cage was a revelation for me. I spent a lot of time messing with tape recorders and home-made electronic instruments, and found that what I was doing had been done by others. It was a relief. Most important thing to remember when desigming/making? Cut out the noise. Unless the point is the noise. In that case, push it until it breaks. My iphone. It is always full of pictures and video. I love teaching because I love making stuff and learning from others who make stuff.